When he’s not playing guitar for the Carl Palmer Band or touring with Neal Morse, Paul Bielatowicz spends his time writing. In fact, he is a columnist for two British magazines, Guitar and Guitar Techniques, and has two guitar instruction books scheduled for release this year. He said the first book charts the evolution of electric guitar playing, while providing tips on how to emulate their styles. Many of the guitarists featured are legendary artists who inspired him through the years, including Eric Clapton, Eddie Van Halen and Nuno Bettencourt. Bielatowicz shows how they influenced each other, with each chapter charting one player to the next. 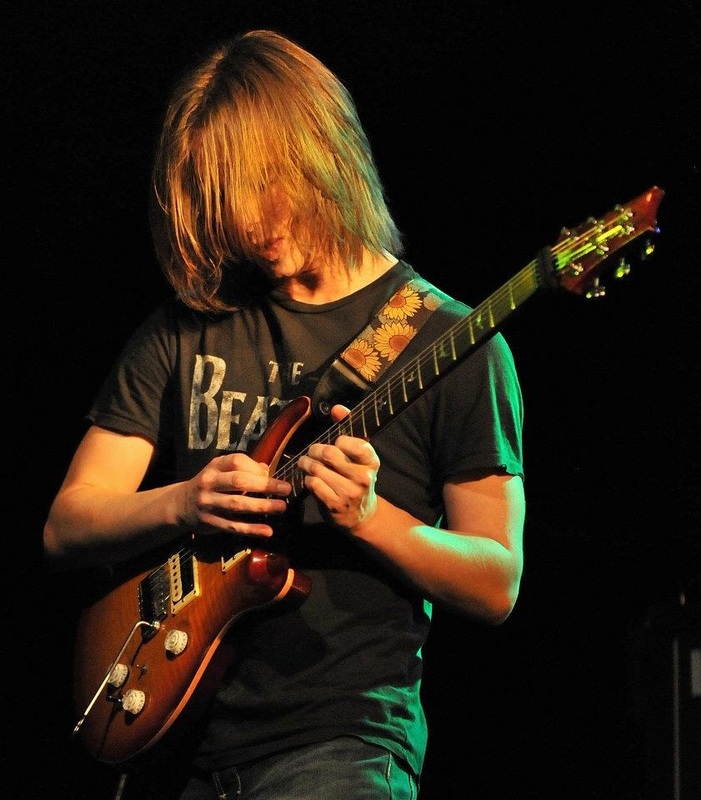 Bielatowicz, who taught guitar at Brighton Institute of Modern Music in the U.K. but gave up teaching the summer of 2010 when touring and recording began to dominate his life, dedicated the last chapter of both books to his readers, as he feels they are an additional link in the chain of guitar evolution. The point, he said, is for readers to take ideas from other guitarists and use it to create their own voice on the instrument. Moreover, Bielatowicz also kept an online blog when The Carl Palmer Band did a U.S. tour in the summer of 2006. Bielatowicz became a member of Palmer’s band in 2003 when Palmer was on the prowl for a guitarist. Palmer asked friends for a few suggestions and guitarist Guthrie Govan recommended Bielatowicz. But, before he hit the road with Palmer, he needed to learn guitar parts that were contrived from Keith Emerson’s keyboard arrangements, as much of the music was recreations of Emerson, Lake and Palmer material. Palmer gave him copies of the band’s live CDs and a three-month learning process began. Through touring with Palmer, Bielatowicz got the opportunity to play guitar for Neal Morse, a multi-instrumentalist and progressive rock composer, who is also known for his Christian-rock background. Bielatowicz said Morse is one of his heroes and he was surprised and honored when the composer asked him to join him on tour. While Bielatowicz said he doesn’t share Morse’s faith, he respects him for it. He described Morse as one of the most “emotionally open” people he’s ever met and is impressed he is able to translate that feeling into music. When gigging with Morse, Bielatowicz said his role is very different to the role he plays with Palmer’s band. With Morse, he feels like he’s a “smaller ingredient” in a bigger recipe. For example, on Morse’s last tour, Bielatowicz was part of an eight-piece band, which he said encourages him to play differently than he plays in Palmer’s trio. As if his resume isn’t impressive enough, Bielatowicz played with guitarist Les Paul, who established the development of the solid-body electric guitar in the 1940s. The two met while he was gigging in New York, as Palmer’s manager, Bruce Pilato, knew Paul and took Bielatowicz to a jazz club where Paul was performing. Overall, Bielatowicz enjoys the East Coast. In fact, he said the highlights of last year’s U.S. tour with Palmer were at the Tupelo Music Hall in Londonderry, New Hampshire, and The Narrows Center for the Arts in Fall River, Massachusetts, two shows the band set up with Limelight Magazine’s publisher, JKB Management and Booking. Before he became a successful guitarist, Bielatowicz was interested in something entirely different: gymnastics. When he was five, he said the sport was his “obsession” and he participated in several competitions. But, he got to a point where he was training four times a week and his body couldn’t handle the stress, as he sustained many injuries. Faced with the choice of either cutting back on training or giving up, he decided put aside gymnastics by the time he was 11, turning to guitar. These days, Bielatowicz plans on writing a solo album, which will focus on playing classical pieces on guitar. He hopes the album will make them sound as if they were written for guitar, while maintaining their originality and integrity. He’s also thinking about having a string quartet appear on some of the pieces, yet nothing has been finalized. Further, he’s been discussing different options with a producer. When he’s not “having tea and scones,” as he resides in Brighton, England, which he described as an “amazing seaside town,” Bielatowicz likes to spend free time running along the seafront. He said he looks forward to time alone. At the moment, Bielatowicz is proud to be part of Palmer’s band. He’s reveling in the thrill of it all. great article. love that paul is so dedicated to learning, teaching,sharing and evolving guitar techniques. he is quite the master of his craft and i look forward to his latest ventures with open ears and soul. keep up the great work paul. definately see you again on the east coast. Saw Paul for the first time – hopefully not the last – with CPB last night in Bay Shore, Long Island and was totally blown away. He’s a tremendously gifted musician, really appreciated the audience and deserves all the goodness that comes his way – he’s earned it! Just saw Carl Palmer Trio in Staten Island tonight at St. George Theater. Don’t miss this band. Nothing more.